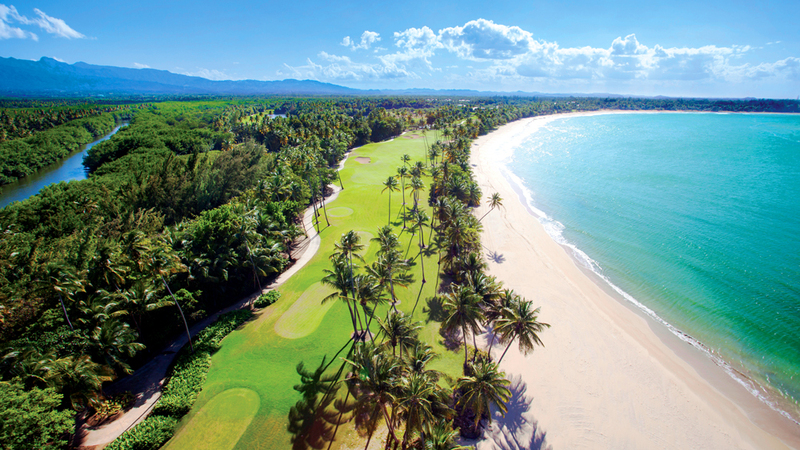 When the St. Regis Bahia Beach Resort opened in late 2010, it (along with the Dorado Beach, a Ritz-Carlton Reserve which opened about a year later) quickly became the standard bearer for luxury on Puerto Rico. 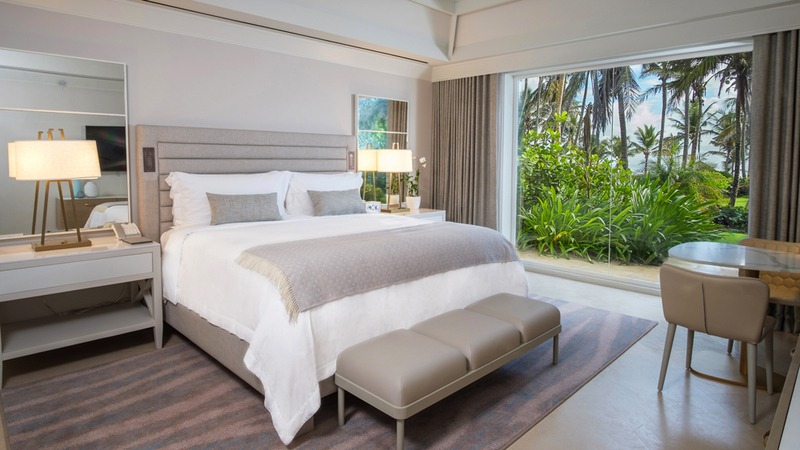 Like many of the other grand dames hit by Hurricane Irma and Maria last year, the iconic resort has used its forced down-time as a chance to recharge and reboot, pouring $85 million into top-to-bottom repair and renovations to ensure it, along with the rest of the island, could come back better than ever. And when it reopens on December 11, it will do just that: welcoming guests back to its 3.2-kilometre stretch of golden sand beach with a completely updated look. The property’s revival was led by celebrated Puerto Rican designer Nono Maldonado and the San Francisco–based Hisrch Bedner Associates, who swapped out its increasingly dated dark woods and warm browns in favour of a neutral palette inspired by—and that puts all the focus on—the lush environment visible from every sweeping window and spacious balcony. Its 139 rooms have been given a chic, residential feel. Walls and furniture are covered in airy white and taupe, leaving either the views of the turquoise Caribbean or the verdant, emerald green gardens visible outside to provide pops of colour. Each feature custom glass bar cabinets that can be stocked exactly to your tastes by your dedicated butler, and plush amenities like sprawling terraces and bathrooms. This same refined feel is found throughout the property’s public spaces, including the Casa Grande, which serves as the heart of the resort. There, guests will find the refreshed Paros fine-dining restaurant, where the restored A Long Awaited Voyage mural by Puerto Rican artist Arnaldo Roche Rabell adds a welcome hit of energy to the elegant space. 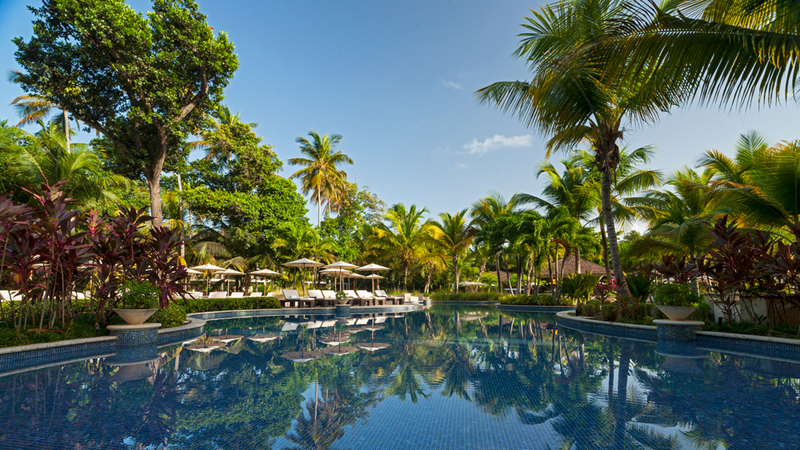 Outside, the carefully considered landscaping—which, when the resort opened, included the planting of 70,000 native and naturalised plants and left plenty of room for local wildlife to roam undisturbed across the property’s 160-plus hectares—has been painstakingly restored. The Tom Fazio–designed golf course is fully operational, and cabanas and sun loungers once again dot the beach and network of glistening oceanfront pools. The casual poolside restaurant and new Beach Shack, have been built (or in the case of the former, rebuilt) below the tree line to ensure for uninterrupted views from nearly everywhere on the grounds. A new partnership with Aquavento Water Sports lets guests take full advantage of the newly-pristine waters just off of the resort, providing equipment and lessons for non-motorised water sports ranging from surfing to fishing in some of the island’s nearby lakes. And for those who want to pitch in with the rest of Puerto Rico’s recovery efforts, the property is working in collaboration with the Bahia Beach Resort Golf Club and the non-profit Alma de Bahia organization to provide volunteer opportunities that will make a meaningful impact on the surrounding community. In addition to renovating all of the property’s existing structures, the St. Regis Bahia Beach has also announced plans for a major expansion—and will roll out 30 luxe Ocean Drive beachfront condominium-style residences, a collection of new Atlantic Avenue Estates, and 60 new oceanfront rooms over the next few years—meaning there will always be another reason to head back to Puerto Rico. The 2020-2021 collection of voyages includes Asia, South America and Africa. Do good while living the good life at these ultra-green properties.